This is the c. 1900 Taride edition of Louis Bretez and Michel-Etienne Turgot's monumental 1739 map of Paris. 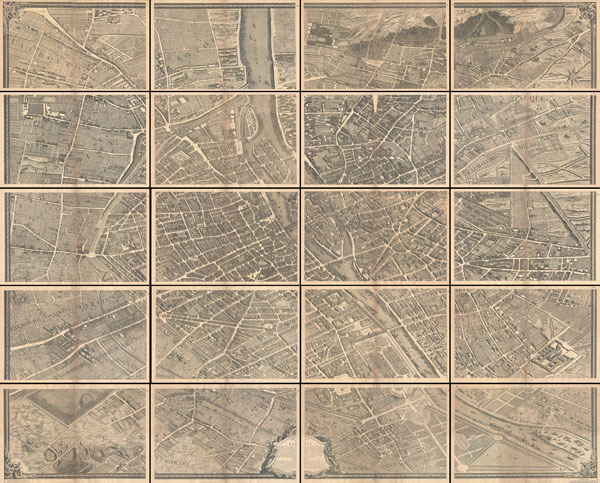 Turgot's map of Paris is possibly the most ambitious urban mapping ever undertaken. Shows the whole of 18th century Paris and offers a wonderful perspective on the city prior to Baron Georges Eugène Haussmann's 19th-century redesign. Turgot, who held the mayor-like office of Prévôt des Marchands de Paris , commissioned Louis Bretez and Claude Lucas to produce this map in 1734. Oriented to the east on an axonometrical projection, this map is best understood as an aerial view where in every building, window, tree, shadow and park is shown. It took the team nearly five years of exhaustive sketching and surveying to assemble this masterpiece. In order to produce the thousands of sketches and surveys required to complete this map, Bretez was issued a permit to enter every building in Paris. The completed map which consists of twenty individual sheets, can be assembled into a massive and striking display roughly 8 feet by 10 feet. Twenty-one loose sheets embraced in a marbled folio, this is Alphonse Taride's c. 1900 issue of Bretez's Plan de Paris. Louis Bretez (fl. 1700 - 1740) was French born sculptor and painter active in the early 18th century. Bretez was a member of the Academie Royale de Peinture et Sculpture in Paris where he specialized in perspective with regard to architecture. Bretez's greatest achievement was his production, with Claude Lucas, of the monumental Turgot Plan of Paris. This spectacular map, one of history's greatest achievements of urban cartography, occupied Bretez from 1734 to 1739. It depicts Paris from a bird's eye perspective with extraordinary detail to the level of individual buildings and trees. Michel-Étienne Turgot (1690-1751) a French businessman and civil administrator in the first half of the 18th century. From 1729 to 1740 he held the mayor-like office of Prévôt des Marchands de Paris ("Master of the merchants of Paris") under King Louis XV. Turgot's greatest claim to fame is his commissioning of Louis Bretez to assemble the spectacular Turgot Plan of Paris, one of the greatest feats of urban cartography ever undertaken. Turgot's more famous son, Anne-Robert-Jacques Turgot, attained prominence as a statesman and economist under Louis the XVI. Average. Individual sheets vary in condition. All exhibit general overall toning and centerfold discoloration. Paper in general is extremely brittle and most sheets have centerfold repairs or reinforcement on the verso. Two or three sheets have minor loss to centerfold. Generally wide margins, 3 to 4 inches, chipped outer edges. Nonetheless, framing and matting will minimize most all flaws and fully display this visually spectacular object. Hodgkiss, A. G., Discovering Antique Maps, p. 77. Harvard University, HOLLIS 004146744.